Let's Rock n Roll Bedheads! 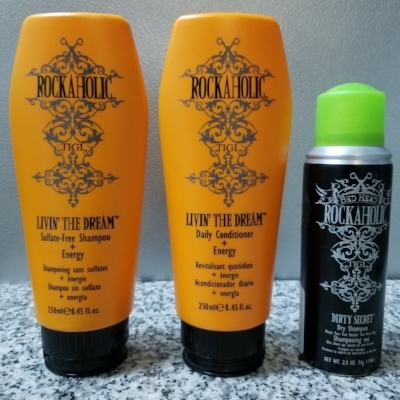 Rockaholic Livin' the Dream Sulfate-Free Shampoo and Conditioner (+Energy) and Dirty Secret Dry Shampoo. For starters, I'm a huge fan of fragranced hair care. That's the first thing I look for when browsing hair care products. But, it has to be good for my mane too. There's no point in having dry hair that smells nice. Most Tigi hair care products smell amazing. I usually go with their Bed Head product line nowadays, since Tigi's Rockaholic line is slowly being discontinued. I actually ordered my shampoo + conditioner duo on Amazon because it's such a struggle to find it stores. And even Amazon is sold out and doesn't have any updates on when they will be back in stock. Most hair salons don't even carry it anymore. And I picked up the dry shampoo mini at CVS, but it's also sold at Ulta, which is good to know for when I restock. Maybe next time, I'll go for the full size to leave at home and the travel size to keep in my purse. When it comes to shopping for my hair products, I'm always thinking ahead to find my next fix.